In February 1968, the City University of New York announced plans for the creation of an “experimental” community-based college that would be located in central Brooklyn. Later named Medgar Evers College, the school was to be the first CUNY campus located in, and focused on, an underserved city neighborhood. Within days of the announcement, community leaders from several organizations began a months-long struggle with CUNY administrators to play a crucial role in determining the mission and development of the college. Over time, their efforts won the community equal representation on a committee tasked with selecting a president and, with persistence and organization, the neighborhood’s influence expanded to other areas, including building selection, hiring, and curriculum. Perhaps most impressively, it was only with the community’s insistence that Medgar Evers College became a four-year college instead of CUNY’s initially proposed two-year institution. The extensive influence of the community during this period represents a key moment in the history of Open Admissions at CUNY. Simultaneously, another local struggle over "community control" was occurring between the United Federation of Teachers and Brooklyn's Oceanhill-Brownsville community along with national upheaval over the Vietnam War and other social justice issues. These local and national events provide the context for, and greatly influenced, the events that unfolded at Medgar Evers College. 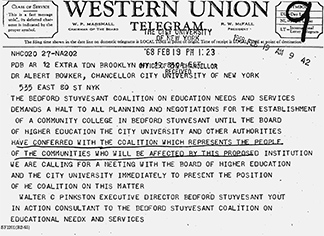 Comprised largely of correspondence between Bedford-Stuyvesant representatives and CUNY officials this collection, curated by Florence Tager, contains everything from official documents, meeting minutes, and telegrams, to internal CUNY memos, handwritten notes, and images, all relating to the struggle over the formation of the college. For more on subsequent events and struggles around Medgar Evers College, see this item in the collection, a short book on the history of the college: Medgar Evers College: The Pursuit of a Community's Dream, by retired CUNY professors Florence Tager and Zala Highsmith-Taylor. Go to all 36 Items in collection.